Our experience in luxury hotels, charter boats and corporate motorsport events, uniquely equips us to deliver well above the usual service you would expect from a hire company. Between us we have 50 years of experience in top level hospitality. Our standards are ridiculously high as we have spent most of our working lives looking after very discerning clients. Our background has formed us into a couple of truly fastidious motorhome hire company proprietors. Our motorsport experience also gives us total confidence with all things practical and mechanical so ensuring our fleet is well maintained and in excellent working order comes naturally to us. Unlike the many companies who offer hire as an add-on to an existing motorhome sales or repair operation, we are not garage owners trying to prepare motorhomes for hire but experienced hospitality professionals with an eye for detail and a real understanding of what it takes to consistently turn out trip-ready, clean vehicles. France Motorhome Hire is structured as a French registered S.A.R.L – the French version of a limited company. Business practice in France requires the Company Directors to file formal annual accounts and the company must remain solvent. When dealing with France Motorhome Hire, you can be assured that your booking will be honoured by a firm with over five years of stable trading and a dependable company structure behind it. 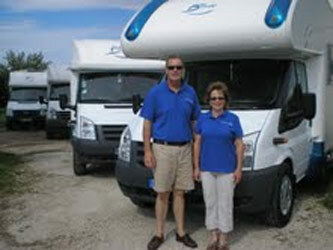 We launched France Motorhome Hire in 2009 and the company is growing each year. To remain competitive and ensure continued growth, we take care to remain price competitive and we don’t let quality or customer service slip as we grow. Our passion for what we do is what motivates us to send out every vehicle in immaculate condition and treat every client with the greatest of care and respect. We started spending our own precious holiday time in a motorhome following a few too many disappointing experiences in other forms of holiday accommodation. Even with a fairly decent budget, we had a string of holidays in villas and hotels that simply did not live up to our expectations and we endured some very disappointing experiences. Constantly adjusting our expectations to accommodate holidays that were not as advertised made us ponder how we might take control of the environment in which we spent our valuable time off. Motorhome trips were our solution and we have not looked back since. Living in France and making our living introducing people to the joys of motorhome travel in this beautiful country could not make us happier. Our repeat clients are growing each year and we feel real satisfaction that they choose to come back to us. We are just delighted that they are as smitten with this style of holiday as we are and trust us to provide exactly what we promise. Most of our clients arrive in France by air and we understand that you cannot bring everything you need for a self-catering trip on a plane. We equip our vehicles with all the necessary equipment from outdoor furniture to bedding, a comprehensive kitchen kit to levelling blocks and the list of equipment continues to grow each year as we listen to client feedback on what should be included. Clients who arrive by car appreciate this too as it makes packing a considerably less daunting task. No matter the destination, purpose or duration of your visit, your trip is really important to us. Your travel plans have been made, your expectations are high and our aim is that you arrive to find a totally trip-ready vehicle (and it matches the one you booked!). We are the only hire company that we know of to maintain a full-time spare motorhome to cover breakdowns or damage. We carry a massive stock of spares and our workshop team is skilled at quickly fixing just about anything from damaged bumpers to faulty fridges. Our mission is to exceed your expectations so put us to the test. Come and share our passion for exploring France in a motorhome.